Burbank, CA - Kilby Enterprises is proud to announce the release of their new Trail Boss Muffler Skid Plate for Jeep JK Wranglers (part # JK-MSP). 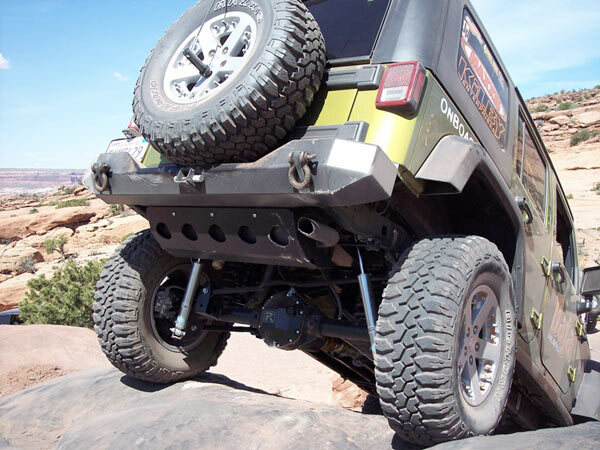 Due to rear-impact regulations, Jeep had to put the fuel tank inside the frame rail, in front of the rear axle on the 2007 Wranglers. This, in turn, meant putting the muffler in the back, exposing it to trail damage. Not good! Kilby Enterprises got to work quickly on a solution. Built from 3/16” steel, the Trail Boss Muffler Skid Plate bolts up easily and works with or without the factory tow hook and receiver. The Muffler Skid Plate gives nearly full coverage underneath the muffler, with the exception of five large breather holes, which allow the muffler to cool. Muffler Skid Plates are powder coated black and are available now direct from Kilby Enterprises or through their dealer network.